Editor’s update: Travis Ganong of Squaw Valley, Calif., won the dark and icy Kandahar downhill in Garmisch, Germany, on Friday — a race that saw Utah’s Steve Nyman airlifted after crashing out (see press release below). Vail’s Lindsey Vonn crashed in downhill training in Cortina but escaped serious injury. Vail Valley ski racing sensations Lindsey Vonn and Mikaela Shiffrin will both be in action this weekend in Cortina D’Ampezzo, Italy, as the women’s speed circuit features a downhill race Saturday and a super-G on Sunday. Vonn is going for her second straight downhill win and the 78th World Cup victory of her career on a track where she’s already won a record 11 times, including the last four World Cups. Shiffrin is hoping to score some critical speed-event points in the overall hunt as defending overall champion Lara Gut of Switzerland continues to close the gap. After several recent speed events in which Gut excels she has narrowed Shiffrin’s overall lead to 130 and could take the lead in Cortina. Shiffrin still has a few more slalom races, her specialty, including home-snow races at Squaw Valley and Aspen in the World Cup Finals, but she needs to continue to score in giant slalom and perhaps eke out some more speed-event (downhill and super-G) points as well to claim her first overall title. Vonn continues to rebound from knee and arm injuries that sidelined her for nearly a year, but she’s on a familiar track in Cortina and she’s coming off a remarkable downhill win at Garmisch last weekend. CORTINA D’AMPEZZO, Italy (Jan. 26, 2017) – The Dolomites stage is set for Lindsey Vonn (Vail, CO), a.k.a. the “Speed Queen,” to prevail. She already has a record 11 Audi FIS Ski World Cup victories in Cortina d’Ampezzo in all disciplines, including the last four World Cup races held here. Laurenne Ross (Bend, OR) was sixth, Jackie Wiles (Aurora, OR) 16th, Alice McKennis (New Castle, CO) 22nd and Breezy Johnson (Victor, ID) 27th. Another Olympic Champion, Julia Mancuso (Squaw Valley, CA), kicked out of the start gate for the first time since March of 2015 on Wednesday, after undergoing hip surgery. Coming through the finish with a big grin and a sigh of relief, she had fun and will look to make positive steps forward. Over on the men’s side, they’ll take on a pair of downhills beginning on Friday—one rescheduled from Wengen—and a giant slalom. 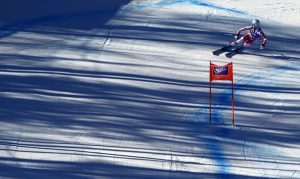 In Wednesday’s training run, Steven Nyman (Sundance, UT) posted the fourth-fastest time, leading the way for a strong American Downhiller contingent including Travis Ganong (Squaw Valley, CA) in 11th, Andrew Weibrecht (Lake Placid, NY) in 12th, Tommy Biesemeyer (Keene, NY) tied for 24th, and Bryce Bennett (Squaw Valley, CA) in 26th. Fans can catch all of this weekend’s speed and giant slalom action on NBCSN and Universal HD, and via live stream at nbcsports.com/live. The races in Garmisch-Partenkirchen and Cortina d’Ampezzo are the final qualifiers for the World Championship team, which will be named next week. Austria’s Marcel Hirscher takes a 368-point lead into the weekend with no sign of a strong challenger to his overall lead. The downhill title chase is all knotted up with Italy’s Dominik Paris leading a group of six athletes all within 20 points. Lara Gut cut Mikaela Shiffrin’s margin to just 130 points with an opportunity to potentially move into the lead in Cortina. Ilka Stuhec holds a solid lead in the downhill standings while Gut is firmly in control of super G. The chase for crystal globes leads up to the World Cup Finals in Aspen. I feel good. I didn’t really ski very well on top, but I skied well on the more technical sections in the super G section. I feel confident—downhill is coming along nicely. Every run I’m getting more confident and I feel better, especially after the win in Garmisch. I feel like I’m finally in a good place. Super G I need a bit more work, so hopefully some of this downhill training will find its way over to super G on Sunday, but yeah—I feel good. It was really fun for me to be back out there. It was definitely nerve-racking. It’s hard when you start in the middle of the season, because you never get an opportunity to train downhill, and I’ve only done two days of super G, so I really had to rely on my instincts. I’m really super happy to be out here and I am still reminding myself to take it one day at a time. Even though I’ve been doing this for a long time, it’s still hard to get used to going fast. The best thing for me, though, is I remember when I was watching before I decided to get surgery – when I was trying to do injections and trying to get back out there—I was trying to figure out how I would ever be in the start again. I would watch the girls and think, ‘There’s no way…I’m so far from that physically, how am I going to get there?’ So, to be able to come up today and stand in the start, and have all of those doubts but just trust and know that my body and my doctors and my physical therapist and all the effort is real, because I don’t think that they’d let me be out here if I wasn’t strong enough. But, of course, there’s always the doubt just wondering what, and how, it’s going to feel when you do it. The course is super smooth and it’s fast, and it feels like a real downhill—there’s some air, and it’s in really great shape. I look forward to this weekend. I’m excited. I’m going to take it day by day and focus on the training run tomorrow and then hopefully go fast in the race. They prepared the hill really well. There are some turns that are almost Beaver Creek-like snow, just really grippy and nice. Then there are some injected sessions. This hill is funny, because it starts in the sun and finishes in the sun, but the rest of the hill is just dark—black—and you have to be able to shift gears. You have to be able to start out in a high gear and be technical, dynamic and fluid, and then shift gears into a glidey mentality then back into a technical mentality and then back and so on. So I feel like a big name of the game is being able to shift back and forth. Today I was good on the flats – which is a strength of mine – but as of late, my technical skiing has been really, really good. So hopefully I can put it all together and lay one down come tomorrow. I like the hill, and we were told no American man has ever won here. So it’d be kind of cool to be the first. Live streaming available on NBCsports.com/Live and the NBC Sports app, which is available on the iTunes App Store, Google Play, Windows Store, Roku Channel Store, Apple TV and Amazon Fire. 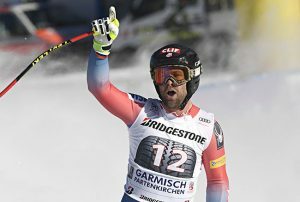 GARMISCH-PARTENKIRCHEN, Germany (Jan. 27, 2017) – Travis Ganong (Squaw Valley, CA) brushed aside a 15-minute course hold to win his second Audi FIS Ski World Cup downhill, leading five Americans into the top 30. Starting bib 12, Ganong endured a lengthy course hold as his teammate Steven Nyman (Sundance, UT) was taken off course following a harrowing crash. Ganong nailed the bottom portion of the course, taking the victory by 0.38 seconds over Norway’s Kjetil Jansrud and Italy’s Peter Fill. The numerous course holds made for a long day for Jared Goldberg (Holladay, UT), who stared bib 52 and just wanted to make it across the finish line before dinner. “We were up there for so long, it was getting to the point where I was like, well ‘screw it!’ I wasn’t expecting a whole lot, but I was just going to ski the best I could before dinnertime,” said Goldberg, who attacked the course and finished 12th, matching a career-best downhill result from Wengen in 2014. Tommy Biesemeyer (Keene, NY) also posted a career-best World Cup downhill result, finishing 15th from the 47th start position. “I think it was so difficult because we only had one training run, and during the training, it was really slow,” Ganong said. “The speeds were really, really slow and everything skied really easy and everyone kind of relaxed … and today, the speeds were way faster. Up next, the men race downhill again Saturday on the Kandahar track at Garmisch-Partenkirchen. The race will stream live on NBCSports.com at 6:00 a.m. EST. Travis Ganong won his second career Audi FIS Ski World Cup downhill Friday, a make-up race from the cancelled event in Wengen, Switzerland. Five Americans finished in the top 30, including Ganong, Jared Goldberg 12th; Tommy Biesemeyer 15th; Bryce Bennett 21st; Andrew Weibrecht 26th. Road to Aspen: Austria’s Marcel Hirscher, who did not race Friday, continues to lead the overall World Cup standings with 1,160 points. Norway’s Kjetil Jansrud leads the overall World Cup downhill standings with 202 points over Italy’s Peter Fill with 199 points. Today was perfect. I was able to push and stick to my plan and not be too phased by all the crashes and everything. It was a tough day for sure. But I’m super happy to win today. I have no expectations for tomorrow. Just show up and try to ski my best. If I ski my best. I know I can win. I’ll try not to think about it too much, and hopefully I’ll have another good day tomorrow. I think it was so difficult because we only had one training run, and during the training, it was really slow. The speeds were really, really slow and everything skied really easy and everyone kind of relaxed … and today, the speeds were way faster. They injected a section for the giant slalom race on Sunday, but they didn’t inject the whole course. So you would hit that little patch of ice on every turn and accelerate. And I think that was a big issue with today. Also, people were pushing really hard and turning off of jumps. It’s never a good thing to have your ski bend when you go off a jump. Maybe they can adjust some things for tomorrow, but I think it’s going to be tough again. You’ll just have to ski smart – it’s downhill! I skied well. It’s a long day, lot of crashes and a lot of (course) holds. So a lot of time to think about it and a lot of time to digest what you’ve seen, so today I kicked out of the start and my plan was to ski really hard, and then once I got off the flat, just stay balanced, stay over the outside ski, and try not to do anything special. Just be strong and be safe. That was scary today. I inspected (the course) this morning and I was thinking how I was going to charge from top to bottom. But then after watching the top guys go, it kind of changed my plan, and for me, that was hard. We were up there for so long, it was getting to the point where I was like ‘screw it!’ I wasn’t expecting a whole lot, but I was just going to ski the best I could. It definitely made me a little nervous seeing so many people crash, but I used it as a lesson learned. It’s helped us formulate a good report for running later and like where to bring our line so that we could be straight over the jumps, instead of arcing off it like some guys did.